A daring captain, a charming personality and a marvellous commentator, the late Richie Benaud OBE traversed generations to become one of the most influential figures in cricket history. An icon of the game, the man simply known as ‘Richie’ will be posthumously honoured as the 40th Legend of Australian Sport at the Sport Australia Hall of Fame’s 34th Induction and Awards Gala Dinner in Melbourne on Thursday 11th October 2018. Today’s announcement coincides with what would have been his 88th birthday (6th October). An inaugural member of the Sport Australia Hall of Fame in 1985, Benaud was unanimously recommended to receive this award in 2008 but requested that the honour be postponed until he retired from his work within the media. Unfortunately, Benaud passed away in April 2015, but this accolade will ensure his legacy will be forever immortalised in Australian sport history. The Sport Australia Hall of Fame’s annual elevation of one member to “Legend” status is the most prestigious sporting honour that can be bestowed. Only the third cricketer to become a Legend, Benaud is honoured alongside Sir Donald Bradman AC (1993) and Keith Miller AM MBE (2004). Richie’s widow, Daphne Benaud, says he would be proud to sit among such company as he had the utmost admiration for them. “Knowing he is up alongside those two would have made him extremely thrilled and honoured because he had such respect for both of them,” she said. The finest leg spin bowler of his era, Benaud proved himself a match winner on numerous occasions. He made his Sheffield Shield debut at the age of 18 and played his first Test aged 21 in the 1951/52 series against the West Indies. Benaud’s skill didn’t blossom immediately. He had little to show for his efforts until he emerged as a fully-fledged allrounder in South Africa in 1957/58, and backed it up as a cool and cunning captain the following summer when he regained the Ashes at home. 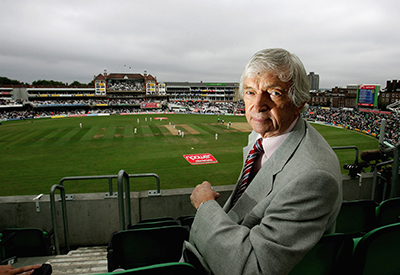 In first-class cricket, Benaud was an aggressive lower-order batsman, scoring 11,719 runs (av. 36.50), including 23 centuries, while taking 945 wickets (av. 24.73). He played in 63 Tests, scoring 2201 runs (av. 24.45), including three centuries and nine half centuries. He also took 248 wickets (av. 27.03) and 65 catches. “He was a true allrounder,” Mrs Benaud continued. His greatest bowling performance came when he took 6/70, giving Australia victory against England and retention of the Ashes at Old Trafford in 1961. In 1962 he was named Wisden Cricketer of the Year and was made a member of the Order of the British Empire before defending the Ashes again at home in 1962/63. At the state level, Benaud captained New South Wales 32 times. His state career with NSW spanned 73 matches and included 3749 runs, 266 wickets and 92 catches. Retiring in 1964, Benaud's records in the game speak for themselves. He is one of a rare group of Australian cricketers to have scored both 10,000 runs and taken 500 wickets in first-class cricket. In 1963, he became the first player in the history of the game to achieve the Test match 'double' of 2000 runs and 200 wickets. Like he was on the field, Benaud was sharp, decisive and authoritative in his journalistic work. Sliding comfortably into the role of commentator, Benaud would become the ‘voice of cricket’ for both Australia and England for nearly half a century. Behind the microphone his pleasant sense of humour shone through. He only spoke when it was relevant and would rarely hyperbolise. The sinking of the Titanic was a tragedy, getting out LBW was not. “He just had the right words at the right moments,” Mrs Benaud said. With class and style, Benaud won many admirers, and the decision to elevate him to “Legend” status was beyond doubt according to Sport Australia Hall of Fame Chairman John Bertrand AO. “Richie transcended the sport of cricket,” Bertrand said. It is a sentiment echoed by Selection Committee Chairman Rob de Castella AO MBE. “Our Sport Australia Hall of Fame Legends are very, very special,” de Castella said. To successive generations of cricket followers, Richie Benaud was held in the highest esteem. With his signature “off-white” blazer and a genteel expression, “two for two hundred and twenty-two”, Benaud was a doyen of the game. “I always smile to myself if I see that score appear,” Mrs Benaud said. Richie Benaud OBE will be elevated as the 40th Legend of Australian Sport at Australian sport’s “Night of Nights” – the sold out 34th Sport Australia Hall of Fame Induction and Awards Gala Dinner on Thursday 11th October at Palladium at Crown, Melbourne.